* Colour temperature information transmission enabled. Flash X-sync at maximum 1/250sec. Continuous shooting speed Max. approx. 5.3shots/sec. * Figures are based on Canon’s testing standards (ISO 100 and Standard Picture Style) and a 4GB card. File size 1920 x 1080 (30p / 25p / 24p): Approx. 330MB/min. 1280 x 720 (60p / 50p): Approx. 330MB/min. 640 x 480 (60p / 50p): Approx. 165MB/min. Crop 640 x 480 (60p / 50p): Approx. 165MB/min. * Automatically set by the focusing mode. Dimensions (W x H x D) Approx. 144.5 x 105.8 x 78.6mm / 5.7 x 4.2 x 3.1in. • All the specifications above are based on Canon’s testing standards. 18.0 megapixel APS-C size CMOS sensor for high quality, wide dynamic range and low noise images. - RAW, sRAW and mRAW. - Choose from a selection of 4 types of filters (Grainy B&W / Soft focus / Toy camera effect / Miniature). Filters can be applied to RAW (expect sRAW & mRAW) and all JPEG images. - Processing RAW images with the camera In Creative Zone modes, a RAW image (expect sRAW & mRAW) can be processed and saved as a JPEG image. Images can be rated with star marks (1 – 5 stars). Users can then browse images based on rated images. - Standard, Strong, Weak and none. - 30p (27.970), 25p & 24p (23.976) frame rates possible. As with EOS 50D, the EOS 60D features a 9-pt all cross-type AF sensors (Centre AF point cross sensor sensitive to f/2.8). - On the LCD monitor, viewfinder and on the LCD panel. 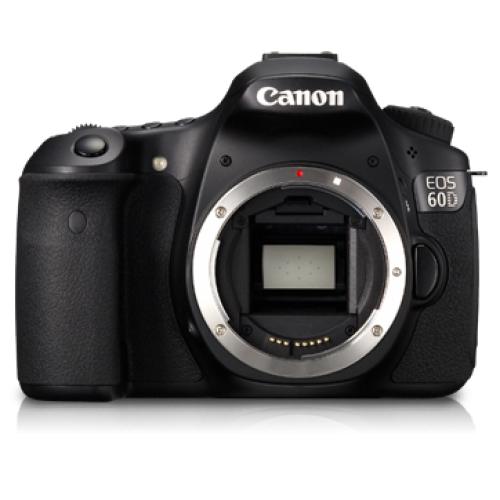 - EOS 60D can not only shoot at the current 3:2, but also can shoot at aspect ratios of 4:3, 1:1 and 16:9. This allows users to match the playback environment for displaying the images. Images with any of the aspect ratios also be resized. - Users are able to operate menus and enter settings easily with the new multi control dial. Within the Quick Control dial is the eight-key multi-controller and the SET button. - From [folder selection] menu, it is possible to create folders and to record images to selected folder. - If "creator" and "copyright owner" are set in the camera using EOS utility, the information will be recorded in EXIF data.